It’s time for our first sweet harvests of the season- rhubarb is here and strawberries are not far behind. I get really excited when I see new seasonal produce in the market and whether I have a plan for it or not, I buy it. That is how I ended up with four giant stalks of rhubarb in my fridge. I had originally intended on making a crumble, but it just didn’t and I had rhubarb getting flaccid in my fridge and so decided to turn this tangy, sour stalk, often found in back lanes across Canada, into something sweet, smooth and delicious. 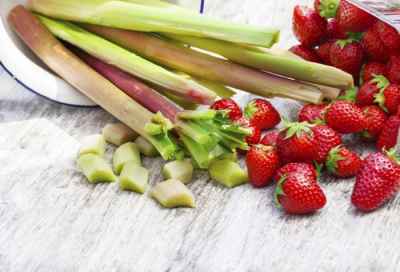 Something you may not know: Rhubarb is higher in calcium than milk per cup where milk has 300 mg, rhubarb has 380 mg. I know you are not going to go and eat a whole cup of rhubarb, otherwise you would end up with terrible…um.. rapid evacuation (always comes back to poop). Today I am sharing two amazing recipes with you for fruity spreadables. We have straight up Rhubarb Butter and a wonderful early summer variation of Strawberry Rhubarb Butter. The main difference between a fruit ‘butter’ an a jam, is that we’re pureeing the finished product to a smooth texture. You could of course keep it chunkier and call it a jam. As with all of the jams I make, I swap out the sugar for honey and use whole apples, or in some cases apple sauce, in place of powdered pectin. Just helps to make the jam or butter a little more natural and unprocessed. This spread goes amazingly well on the Banana Berry Oatmazing Muffins from my cookbook, and also is perfect on a slice of my grain free almond bread. 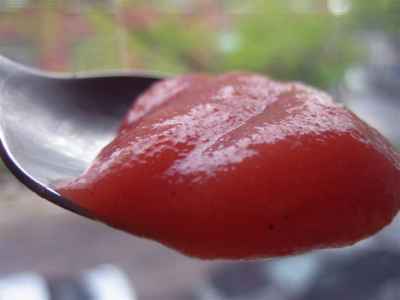 An easy 5 ingredient rhubarb butter recipe using all natural ingredients. Puree together the apple and rhubarb until smooth in your food processor or vitamix. Pour apple/rhubarb mixture into a pot and mix in honey, vanilla and cinnamon. Cook for about 15-20 minutes or until desired consistency is reached. Pour into jar, (if canning, do your canning thing) and allow to cool. As I mentioned above, adding strawberries to the mix makes an awesomely simple variation. 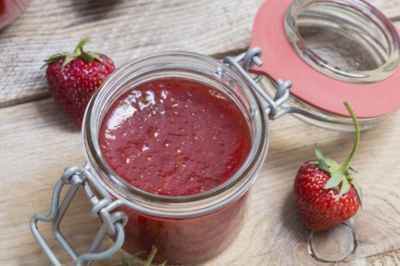 You can also swap both the strawberries and rhubarb and do the same with apples, pears, plums, peaches or any of your favourite market-fresh fruit. These butters also make an excellent filling for thumbprint cookies!